Creating “Super Corals” for Warmer and Acidic Seas – Neptune 911! Researcher Madeleine van Oppen collects coral fragments for her breeding project. In Hawaii this summer, as corals engage in their once-a-year courtship ritual of releasing sperm and eggs into the water by moonlight, Ruth Gates will oversee a unique mating: the coming together of “super-corals” in her lab. Gates and her team at the Institute of Marine Biology in Kaneohe tagged corals in their local waters that thrived through a heinous hot spell last September. A few of those rugged specimens will be picked for arranged marriages this month, hopefully yielding some offspring even better suited to thriving in the warmer waters of the future. It will be, she thinks, the first selective mating of corals to try to help them thrive in the face of climate change. The work can be tricky — corals don’t like to be touched when breeding. And it’s controversial — some find the idea of active intervention in coral ecosystems disconcerting, since it turns a natural environment into a planned one that might be less biodiverse and less resilient to unexpected challenges like disease. The idea of tinkering with coral genetics is even touchier, even if current work focuses on simple selective breeding for the hardiest corals, rather than on the more controversial prospect of producing corals that have been genetically modified. But Gates thinks it’s necessary. Studies on the Great Barrier Reef and in the Red Sea have shown that the rate at which corals calcify their hard shells has declined by 15 to 30 percent since 1990 thanks to One expert proposed ‘gardening’ and restoring coral reefs in the same way that silviculture manages forests. thermal stress; an influential 2008 report on global coral status showed that about 20 percent of global coral coverage has been lost since 1950. In August 2014, an unprecedented 20 species of coral were listed as threatened under the U.S. Endangered Species Act, bringing the total on the list to 22. The global culprit is climate change — which brings heat waves that devastate the symbiotic algae living within coral and bleaches the animals deathly white — along with rising acidity that literally dissolves coral bodies. Locally, reefs also face disease, fishing nets that scrape the ocean floor, water pollution, and hurricanes. “Coral reefs are astonishingly resilient and have survived devastating blows from natural disasters in the past,” writes evolutionary ecologist Les Kaufman of Boston University. But he adds that they have never faced all these challenges together. There is a shortcut available. In 1995, Baruch Rinkevich of Israel’s National Institute of Oceanography in Tel Aviv proposed that researchers start “gardening” coral reefs on a grand scale, actively restoring corals in the same way that silviculture manages forests. The idea is simple: take broken pieces of coral, grow them in a nursery under controlled conditions (as hobbyists have been doing for decades), and then replant them where needed. But this approach faces challenges: Replanted corals are often gobbled up by hungry parrotfish or wiped out by disease. And the scale is daunting. Some reef-building corals grow just a millimeter a year, and there are more than 110,000 square-miles of coral reef on the planet. Nursery projects have proven they can boost coral growth. Once planted in the ocean, some nursery corals are an order of magnitude more reproductive than their natural brethren, says Rinkevich. “They’ve had the To date, coral restoration projects are still just a drop in the bucket. best start in life,” he explains. In Florida, Vaughan has learned how to boost some particularly sluggish coral growth rates dramatically: His team surgically slices donor coral fragments into tiny pieces to promote faster regeneration. Doubling the size of a quarter-sized fragment used to take several years; now it takes months. Around the world to date, more than 100 species of coral have been successfully raised in nurseries. But such projects are still just a drop in the bucket. The largest efforts, from the Philippines to Florida, have replanted tens of thousands of corals and the total globally stands at about 100,000, altogether covering perhaps less than a square mile. Some are hoping to scale that up. “I have a personal challenge to not retire until I plant a million corals,” says the 61-year-old Vaughan. Rinkevich has also applied for funding for a one-million-coral project in Tanzania. At that scale they hope their ‘drop’ will start to have an ecological impact. “If we could plant 10 million staghorn corals we could de-list them,” estimates Vaughan. “So I need nine other crazy people like me,” he laughs — and, at a cost of about $1 to $10 per coral, a lot of funding, too. Regardless of scale, these efforts are useless if the corals die — which sometimes happens. In one project in Bolinao, the Philippines, replants were walloped by bad weather, including two super-typhoons and three regular typhoons. “We were unlucky. Many died,” says Rinkevich. To face those odds, conservationists need to be sure they’re planting not just a lot of corals, but the right corals. “We want to be sure we’re picking winners,” says Vaughan. This July, Vaughan switched on some adjustable tanks in his Florida lab that will let his group control the temperature and pH in which their baby corals are raised. In this way they can select the hardiest for future planting in the ocean. Likewise, van Oppen will be studying coral responses to stressful conditions in Australia’s massive National Sea Simulator, a facility with more than 900,000 gallons of seawater tanks. And Stephen Palumbi, a marine biologist at Stanford University in California, last year started to build his own ‘smart reef’ off Ofu Island in American Samoa, with the hardiest corals he could find. Palumbi’s experimental reefs were hit by warm waters and started bleaching in January; he and his team are just now looking to see if the transplanted corals from a warm-water-adapted pool fared better than other corals in the region. Researchers don’t need to know the specific genes involved to do selective breeding, but they do need to know that the traits are inheritable. Recent work suggests they are. 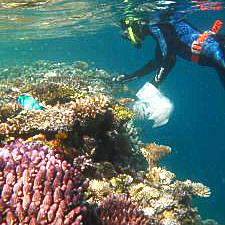 Mikhail Matz at the University of Texas in Austin and colleagues crossed four coral colonies from two locations in the Great Barrier Reef off Australia to make 10 different offspring families, and tested their survival in hot waters of 35.5 degrees C, or 96 degrees F. They Genetic modification for ecological preservation is very rare, but not unprecedented. found that having a coral parent from the warmer location boosted survival odds up to five-fold. Meanwhile, van Oppen, Gates, and others are trying to work out how best to get coral gardens to grow. Alongside selective breeding programs, they are also going to see how corals can best acclimatize to new conditions — there are hints that simply raising corals in challenging conditions can activate their latent ability to cope with those environments in a way that can be passed on to the next generation. Van Oppen says they’re even “playing around a bit” with trying to intentionally splice in specific gene variants to make genetically modified (GM) corals designed to cope with heat or acid. “But,” she quickly adds, “that’s when you start to hear a lot of resistance. That’s not part of the Paul Allen grant for that reason.” Genetic modification for ecological preservation is very rare, but not unprecedented: Researchers have made GM American chestnut trees to resist fungal blight, although they don’t yet have permission to plant them.